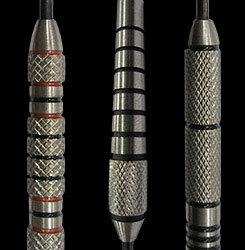 If you recently started playing the game of darts you are probably using a set of bar darts. Soon you will get hooked on this great game, and you will be ready to upgrade to your own set of darts. Players usually go in one of two directions when choosing their first set of darts. Some players pick out a set they think looks cool, while others pick a set similar to the darts of a player they look up to. Both ways are great when you are just starting. As you progress in the game though, there are several factors that you should take into consideration when choosing your perfect set of darts. How do you hold your dart? When picking up a dart for the first time, most players will hold it just like a pencil. Check for yourself the next time you are throwing. The way you hold the dart is a key factor in finding the right set, so it is important to try holding your dart in a variety of ways before you start shopping. Do you hold your dart towards the front? If so, a front-weighted dart might be your best choice. Do you hold the dart in the back of the barrel? A rear-weighted dart might be best in this case. I hold my dart right in the middle, so I use an evenly weighted dart. What type of feel do you like on the dart? There are many different styles of darts and tons of choices in this area. Some people like their darts to be smooth with little or no knurl. Some like the whole barrel to have a very sharp or rough edge to them. This is a personal preference that you should decide while trying different darts. Your preference may change over years of playing darts. Sometimes changes in your life or career can dictate a change in the texture you like on your dart. As you proceed in your darting life, do not be afraid to try new types or styles of darts. Which dart weight do you want to use? This is a key area that many people have never really given much thought to. Most shooters only consider darts in the 16-20 gram range. These are the most common weights for sure, but do not limit yourself to this range if it does not feel right. I shot with an 8.8 gram barrel for 20 years and was very successful with them. About two years ago I was not comfortable with how I was throwing and my consistency was off. I tried a 16 gram dart and found myself shooting much better. I have since moved up to my new signature darts that are 18 grams, and I feel like I am playing better than ever. Realize that you can never stop learning and trying new things. You never know what change might make the biggest difference in your game. What's your budget for new darts? This is another important part, as we all know times can be tough sometimes. There are great choices in all levels of darts, but like anything else you get what you pay for. You can get a good set of darts for as little as $35.00, all the way up to signature series darts for $200.00. Many of the lower price darts are not made to the quality standards of the higher price ones. Make sure you are comfortable with your choices in all of the above areas when deciding which darts to buy. Remember that you will be relying on these darts at the most critical times during the biggest events or leagues in which you'll be competing. The most important thing to remember is that darts is a game, have fun with it! Good luck and shoot well. Don't forget, Dart Brokers has everything you need to become the best darter you can be!